A throwback to my college days of hanging out with a bunch of vegans–this one’s a real crowd pleaser. 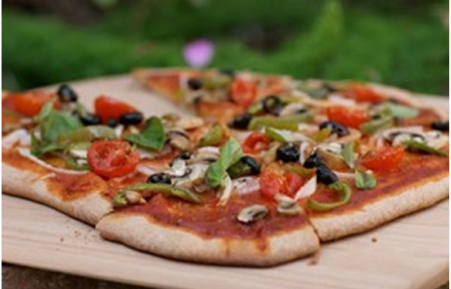 Nearly every Shabbos this summer, we’ve been enjoying homemade pizza oozing with tomato sauce and roasted vegetables. Kids, single guys, even guests who warily join our “heavy on the veggie” home, take a slice (or several!). And best of all–it takes less than 10 minutes to prepare. Cover the crust with tomato sauce, using more than you would on a cheese pizza. Cover the sauce with the veggies (I like big slices of tomatoes on top to hold it all together) and sprinkle the chopped herbs over all of it. Drizzle olive oil on top and bake for 20 minutes at 375 degrees. Slice when cold and serve warm. yum. this makes me hungry. do you serve it at lunch?? How do you warm it for lunch? I put it on an electric warming plate. Be careful not to leave it too long, though, or the bottom gets too hard. Good luck! I ate over at granoladox and she served this tasty dish (and many more) and it was AWESOME! !